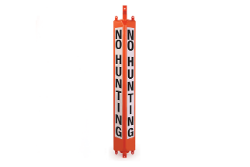 RM SIGN NO HUNTING MKR ORANGE 3.5"x4.25"x27.5"
Typical, two-dimensional signs tear off in strong winds and are not visible from all sides. But 3D Post™ signs are durable and can be easily read from 360 degrees! Sturdy and strong, 3D Post™ signs are easy to install in minutes and are made to last. Sign won't bend, tear off, or blow away. Solid construction withstands sunlight, summer heat, and winter cold. Bright colors and bold wording won't fade. 3.5” x 4.25” x 27.5"